There’s Albuquerque, there’s Cappadocia, and then there’s Château-d’Oex. Haven’t heard of that one? It’s a beautiful Swiss town known for it’s International Hot Air Balloon Festival, of course! INTERESTED IN LEARNING MORE ABOUT OTHER SWISS WINTER ADVENTURES? READ ABOUT SLEDGING, FONDUE HIKING, AND CLIFF WALKING! Château-D’Oex is a French speaking town in the district of Pays-d’Enhaut. From the town of Montreux on Lake Geneva it is a quick (and insanely beautiful) one hour train ride. 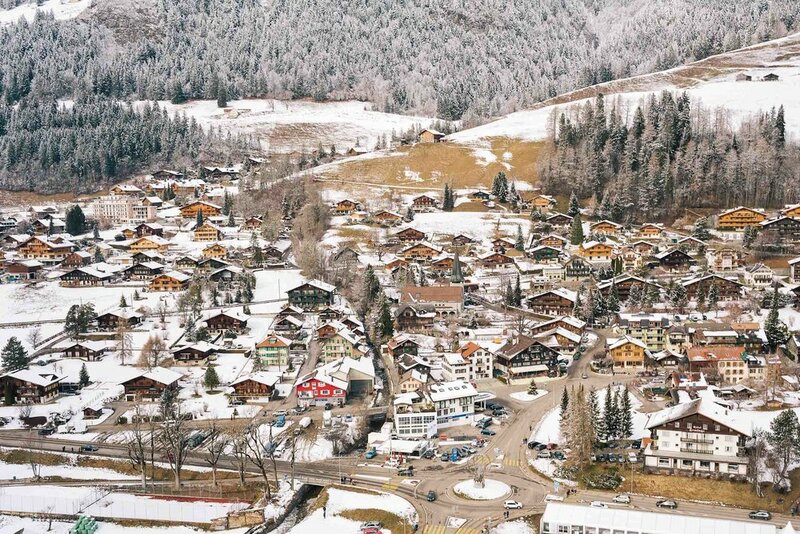 Château-d’Oex is a charming little town, famous for being the World Alpine Capital of Hot Air Ballooning. Each year there is a nine day international festival which takes over the entire town at the end of January. While I definitely recommend visiting during this time, if you aren’t able to make it then you aren’t entirely out of luck — passenger flights are available through the year. This year marked the 40th International Hot Air Balloon Festival of Château-d’Oex. Once Kristen learned of the festival and that it would be celebrating a big anniversary this year, we knew we had to include it in our itinerary. While the festival itself lasts for nine whole days, we were only able to make it for two of them. The program includes a handful of different events and details what is happening when, so make sure to check that before making any plans if you aren’t able to be there the entire time. During our time there we were able to do two main things that I highly recommend: attending the Night Glow and taking part in a passenger flight. The Night Glow event is one that happens at night, of course, and is a show of both lights and sound. The performance includes hot air balloons, paragliders, fireworks, and more! Everyone meets on Temple Hill which overlooks the “stage" across the hill. Since this happens in January and at night after dark, it will be very cold. Make sure to dress incredibly warm. 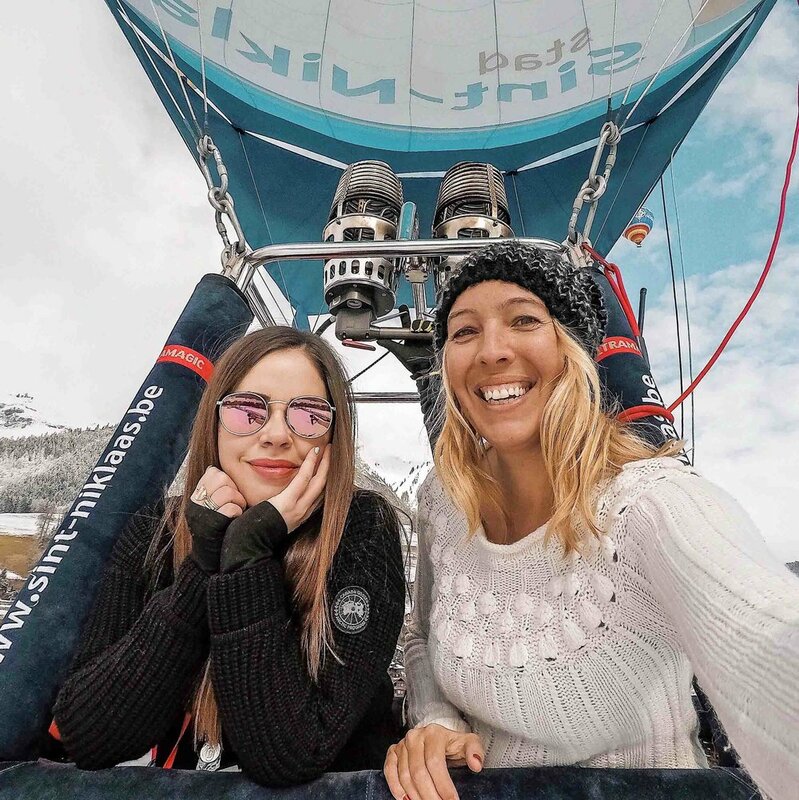 The passenger flight was the most exciting part for me, especially because I had never flown in a hot air balloon before. They are offered everyday of the festival at 9:30 and 2 pm. You can find more information on pricing and more here. Prior to taking off you have to prepare your balloon for the ride. It takes a bit of time, I’d estimate anywhere from 30 to 45 minutes depending on the setup. All the balloons at the festival launch from the same spot so this can be a good time to grab some photos of the balloons taking off or getting setup (in addition to helping setup if needed, of course). For our flight we were paired with a really sweet couple from the Netherlands. Our pilot’s entire family more or less was in the industry so they also had her parents there to help setup which meant we didn’t need to do much at this point. They even brought their 2 year old up with us! Since it is winter and weather can be a bit testy, you’ll likely need to be flexible as far as timing goes. We were supposed to launch early and ended up being told last minute to wait an hour before heading to the festival because we weren’t able to go at the time originally planned. Once we finally took off the weather was completely overcast and gloomy. After a little while it started snowing which was a truly magical experience. It became somewhat hard to see around us and was as if we were in the middle of a snow globe. As we watched the snow fall around us everything was dead silent except for the sound of our balloon. Once the snow stopped the weather completely cleared and were met with sunny, blue skies. It was again absolutely breathtaking, in a different way than the snow globe, and such a pleasant way to end the flight. We really lucked out in terms of weather, especially since we were able to get a mix of everything. Our ride ended up being around 1.5 hours, whereas most of the others were around 30-45 minutes. All in all, I would definitely recommend visiting Château-d’Oex for the International Hot Air Balloon Festival any chance you get. It’s a unique and fun experience, one that many people don’t even know you can have! While attending the festival we stayed in the neighboring town of Rougemont at Hotel Valrose. It was beautiful and the town is adorable - I highly recommend staying with them. Rougemont is 10 minutes by train from Château-d’Oex. WHAT DO YOU THINK? 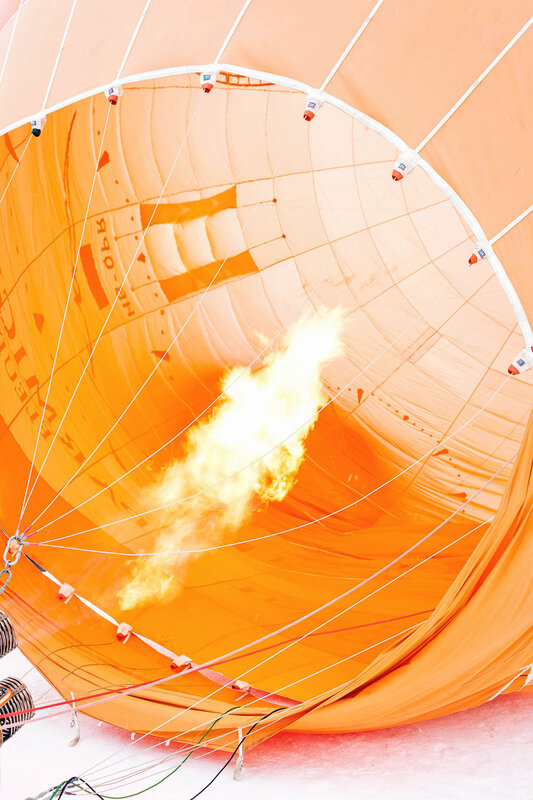 DO YOU WANT TO CHECK OUT THE INTERNATIONAL HOT AIR BALLOON FESTIVAL? LAYERS. The last thing you want is to be too cold and with layering if you get too hot you can just remove some! My go-to is HEATTECH from Uniqlo which captures your body heat and uses it to generate warmth. There are tank tops, long sleeve shirts (in regular, extra warm, or ultra warm), turtle necks (regular and extra warm), and more. I also can’t recommend this sweater from Canada Goose enough. LEGGINGS. To wear under your snow pants! Or alone. Or under jeans. I bring these in both extra warm and ultra warm, as well as my favorite Alo ones. FLANNELS/BUTTON DOWNS. I am ride or die for Rails button downs, buying new ones each year. They are very warm and an easy way to look a little more presentable than a plain old tee. I resort to these a lot on less adventurous days (strolling around town, shopping, etc.) as well as for dinners. I love this one, this one, and this one. CASHMERE WRAP. I actually travel with this year-round, I even have one in my purse right now as I am writing this. You never know when you’ll need an extra layer on a cold plane, train, restaurant, or something else. Here’s a great option! CARDIGAN. Because this Barefoot Dreams cardigan is honestly life changing. PARKAS. VERY important! Your coats will be on and visible the majority of the time and therefore, if possible, I would bring numerous coats (instead of using that space to pack more sweaters, for example). I have worked with Canada Goose over the past two years and have been lucky enough to be gifted a handful of coats, but in all honesty they are 100% worth it. The attention to detail is remarkable (even random things like the sleeves are SO warm and soft), they have a lifetime guarantee, and they are remarkably warm. If you can splurge on one I am confident you will not regret it. WARM SOCKS. For obvious reasons. There are some HEATTECH ones: crew length, knee length, and over the knee. COMFORTABLE, WARM, WATERPROOF BOOTS. I like these and these. SCARVES. An absolute necessity! My favorite are these from & Other Stories, available each year in a handful of the most beautiful colors. GLOVES. One day I somehow forgot my gloves at the hotel and have never been more miserable in my life, so I would recommend bringing at least two pairs and always double checking that you have them before heading out. These are nice. CONVERTER ADAPTER. This one is universal and work no matter where you’re going. When going to the EU I also bring along this very inexpensive 6 pack so that I have extras. So much to charge these days! Want the full list? See HOW TO PACK FOR A SNOWY WINTER GETAWAY.